At HVDS we help clients in the Food Industry with cleaning and maintenance of air filtration and extraction systems. Our teams work to ensure that systems are suitable for use, hazard free and audit compliant. In this instance, our team were called to investigate a case of poor airflow. The HVDS team were called on-site to a food factory to investigate poor airflow and leaking ducting. This is what they found. So, what is wrong with these pictures? 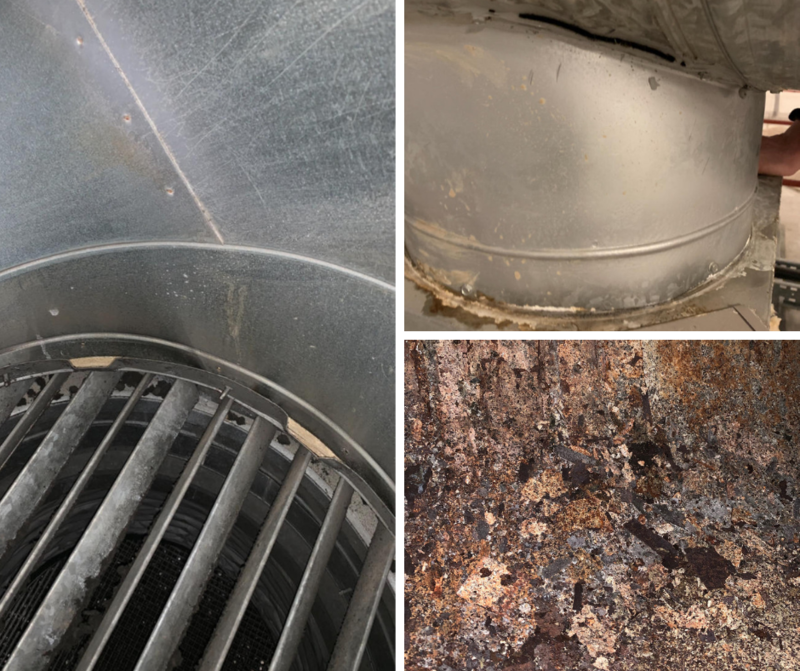 These pictures clearly highlight poor workmanship on an installed ventilation system. Consequently, this meant poor airflow in the food factory, and the ventilation system not performing correctly. Solving the problem – how did we proceed? The HVDS team worked with the customer to rectify these issues and ensure correct installation, so that their food factory ventilation systems work effectively and successfully. At HVDS we offer free ‘behind the scenes’ surveys to give you peace of mind, as well as offering cleaning and maintenance services to keep your ventilation systems in good working order. Contact us today on 01785 256 976 to find out more about our clean air solutions for the food manufacturing and processing industry. The New Minimum Energy Performance Standards (MEPS) Includes HVAC Systems. © 2017 HVDS. Website by Revere-IM.